The wait is over! The first reveal of this year’s Toku Toy Box has finally come and it is the Kamen Rider Prize Package! Check out the video below for all the goodies. Please be sure to “Like” the video and Subscribe to our YouTube channel so you don’t miss a single update for Toku Toy Box! Special thanks to our own Kamen Rider OOO for donating to this prize package! 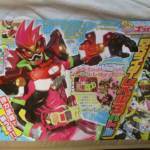 Kamen Rider Ex-Aid LVL 3 Scans Online- New Gashat Forms Revealed! A new round of magazine scans has come online, giving us a look at the future adventures of Kamen Rider Ex-Aid! This month is all about the new Rider Forms- LEVEL 3! By inserting a second Gashat into the GamerDriver, the Riders can unlock special powered armor to enhance their combat skills even more. *The enigmatic Kamen Rider Genm was the first to demonstrate his LVL3 form, using the Shakariki Sports Gashat to unlock his Sports Action Gamer LVL3 configuration. These scans may at last reveal Gemn’s true identity! *Ex-Aid gains the Gekitotsu Robots Gashat and becomes Kamen Rider Ex-Aid Robots Action Gamer LVL3. *Lazer sheds his vehicular configuration with the Girigiri Chanbara Gashat to become a stand-alone rider, Kamen Rider Lazer Chanbara Bike Gamer LVL3. *Snipe finds the Jet Combat Gashat and uses it change into Kamen Rider Snipe Jet Combat Gamer LVL3. Last but certainly not least, we have some images from the upcoming Kamen Rider Heisei Generations teamup film! *Kamen Rider Ghost receives the Ex-Aid Eyecon to transform into Kamen Rider Ghost Ex-Aid Damashii! *The ultimate villain of this exiting crossover, Dr. Pac-Man is finally revealed! He has a unique army of Bugster soldiers to fulfill his desires. Definitely some thrilling adventures ahead for this Rider series! Stay tuned to TokuNation for all Ex-Aid news! 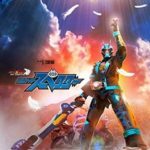 Kamen Rider Ghost V-Cinema Project Announced! Looks like Toei’s not ready to give up the Ghost just yet! A new V-Cinema project for Kamen Rider Ghost has been announced. Titled Ghost RE:BIRTH- Kamen Rider Specter, this new movie will apparently feature the adventures of Makoto in Ganma World as the next chapter in his story. 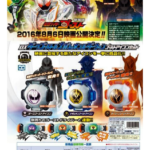 This V-Cinema release will also come with one more Eyecon for collectors- the Shin Specter Eyecon! Ghost RE:BIRTH is currently scheduled for release on April 17, 2017. First Image of Kamen Rider Ghost Mugen Damashii & Kamen Rider Dark Ghost Online! The first image of Kamen Rider Ghost in his final form has surfaced online! This is Mugen Damashii, an untold level of power obtained through the Mugen Ghost Eyecon. Mugen appears to be a basic white form with crystal highlights. Sadly, the details of how Kamen Rider Ghost obtains this final upgrade are unknown at time of writing. In addition, we also have an image of a NEW Rider to be introduced in Ghosts’ summer movie- Kamen Rider Dark Ghost! This new character is based on a black recolor of Ghosts’ Tokon Boost form and has two new Eyecons- Napoleon and Darwin. Stay tuned to TokuNation as we keep you up to date on all Ghostly details! The seventh and final entry in the Kamen Rider Ghost Legendary Rider Net Movie has been confirmed as a direct-to-DVD exclusive special edition! This adventure will be packaged with a special DX Eyecno called the 45 Kamen Rider Eyecon and will grant Ghost two new forms: 1Gou Damashii representing the early Kamen Riders, and Heisei Damashii as a salute to Riders of the modern age. Kamen Rider Ghost’s adventure with the 45 Rider Eyecon will be released on April 29, 2016! Some brief teasers have been posted online revealing new upgrades for the heroes of Kamen Rider Ghost! 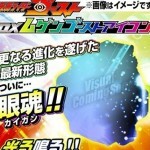 *Ghosts’ final form will be known as Mugen Damashii and will be unlocked with the Mugen (meaning Infinity) Ghost Eyecon. *Kamen Rider Specter will gain the Deep Specter Ghost Eyecon and obtain an even stronger form- tentatively know as Kamen Rider Deep Specter. 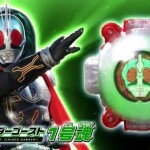 *A special anniversary Eyecon known as the Kamen Rider 45 Eyecon will be included with an upcoming DVD release containing all the Legendary Rider Net Movies. Sadly, there are no images online yet for these new forms. Stay tuned to TokuNation as we keep you up to date on all Ghostly news! Kamen Rider Ghost Q2 Catalog Details- Introducting Ghost Tokon Boost & Kamen Rider Necrom! 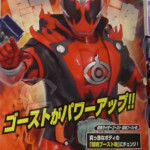 Some new images from the second wave of Kamen Rider Ghost toys have been posted online! *We now have our first look at Ghosts’ upgraded form, Ghost Tokon Boost! This design adds a flame motif to Ore Damashii and greatly enhances his abilities. *Tokon Boost Damashii gets a new weapon- the Sunglaslasher! This sunglasses-shaped-saber can hold two Eyecons and perform combo attacks. *Last but certainly not least, we also have brief teasers for the next two Damashii forms- Goemon and Ryoma along with three upcoming Eyecons– Grimm, Sanzo and Himiko. All times are GMT -4. The time now is 5:51 PM.